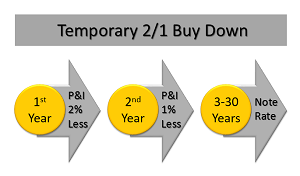 A 2/1 is a common buydown that the first year’s payment is calculated at 2% lower than the note rate and the second year’s payment is calculated at 1% lower than the note rate. The third through thirtieth years’ payments are the note rate.A temporary buydown is fixed rate mortgage that the seller has prepaid interest at closing to lower the payments for a number of years. The borrower must qualify at the note rate but gets the benefit of lower payments for the early years.